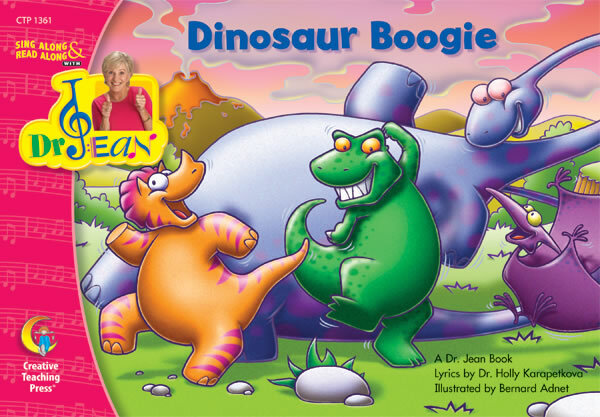 Dr. Jean's popular songs have been adapted to illustrated books in the Sing Along and Read Along with Dr. Jean series that can be used in your class with your students. Lyrics are by Dr. Holly. Creative Teaching Press has many titles available for you. You may purchase single copies, collections, and CDs from their web site. Click here for more information. will find a button for sample pages, too. Twelve popular Dr. Jean songs have been hand selected and transformed into delightful readers. These fun and whimsical stories support early learning concepts by nurturing oral language, alphabet recognition, and print knowledge. These motivating stories are easy to act out and make learning fun! Gr. PreK-1. 12 pages ea. You can download sample pages from the Creative Teaching web site. Just click this link. When you get to the web site, choose a title and click on the Details button. That will take you to a page for the book you selected, and you will see the button for Sample Pages.